Docker is the most revolutionized technology in virtualization world now a days. 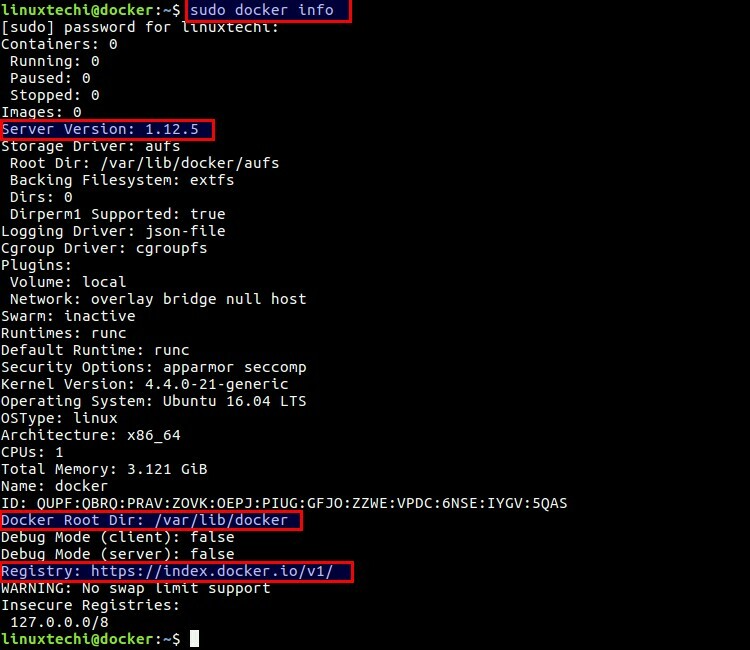 Docker is actually an open source project which provides container technology. A container is a light weight VM(virtual machine) or a process which allows us to install Linux based applications inside it. Container don’t have its own Kernel, RAM, CPU and Disk but it uses the under lying OS kernel, RAM, CPU cores and Disk. Container provides process base isolation where virtual machines provides resource based isolation. The main benefit of containers is that we can provision a container in less than a second because launching a containers is actually starting a process in Linux. Docker engine package is not available in the default Ubuntu 16.04 server’s repositories. Let’s add the GPG key for docker repository using below command. [email protected]:~$ sudo add-apt-repository "deb [arch=amd64] https://download.docker.com/linux/ubuntu $(lsb_release -cs) stable"
Step:3 Install docker engine package using apt command. Now this server will work as Docker Engine or Container Engine. A Bridge is also created which will acts as L2 switch and will provide IP address to the containers from its own DHCP server. Docker installation part is completed now, let’s get familiar with some basic commands of Docker with examples. Whenever docker engine is installed, default Registry Server is updated in docker command. When we run the docker command to download and search images then it will go the registry server to fetch the mentioned docker image. Though we can change this registry address as per our setup. Let’s assume we want search latest centos docker image. Let’s suppose we want to download Ubuntu 16.04 docker image. Once the image is download then it is stored locally in docker host image repository. We can list the available images in our local repository using ‘docker images‘ command. Let’s suppose we want provision a Ubuntu 16:04 container. Note: In case if we don’t mentioned OS version then it will try to provision latest one. To stop the container type ‘exit’ in container console. If you don’t want to stop the container but want go back to docker engine console, the type ‘ctrl+p+q‘ in container console. Starting a Container in detach mode. By Default Containers can reach to outside world and each outgoing connection will appear as if request is coming form docker’s host IP address but from outside world no one reach to containers. Using port translation method we allow outsiders to reach our containers. In docker command we have commit option to save the changes of container to a docker image. Let’s assume in above container we have installed web server and want save these changes to a docker image so that in future we can launch web server container from docker image. Use ‘docker rm‘ command to delete containers either based on their names and ids, Before deleting a container make sure it is stopped. That’s all for this article. Hope you got an idea how to work with containers.Please share your valuable feedback and comments. Is there any essential difference in installation and administration between Ubuntu and Debian? I prefer to use the Debian Linux, latest release. What are the main points I should pay attention to?